ibVPN (Invisible browsing VPN) is a high-rating and reliable VPN service. over 1 million users are using this ibVPN. ibVPN provide 15-day money-back guarantee. Almost users are satisfied with ibVPN service. ibVPN practices strict no-logs policy. They never log users’ internet traffic and other personal information. ibVPN builds huge network with over 200 servers from 47 countries in 63 locations. It provides fast and stable speed, and you can access any websites from anywhere and anytime. ibVPN uses the military grade encryption called AES-256 bit and multiple advanced features to ensure online privacy and security for customers. Your sensitive data like payment types, bank account, ID number, logins and passwords will be protected by this AES-256 encryption. This encryption method is unbreakable encryption which can’t be decrypted by anyone. ibVPN applies multiple VPN protocols including OpenVPN, PPTP, L2TP, SSTP and IPSec/IKEv2 to offer highly security for users to surf online randomly. ibVPN provides compatible apps and applications working well with all major and popular systems including Windows, Mac OS, iOS and Android. ibVPN also provides extension compatible with browsers like Microsoft Edge, Google Chrome, Firefox, Safari and others. ibVPN helps bypass censorship and geo-restrictions to access your favorite websites and apps like Netflix, Hulu, Amazon Prime Video and others from anywhere and anytime. Since all your internet traffic and online activities are encrypted by strongest AES-256, no one can steal your data. ibVPN combines multiple advanced technologies and features like kill switch, auto reconnect, Stealth VPN, Double VPN, Tor over VPN to make it more powerful. All these advanced and strong features and technologies increase more security and online privacy for customers. that’s why ibVPN users are satisfied with the service. ibVPN now provides Holiday exceptional offer up to 78% off, as low as $2.42/month. This Holiday Offer plan allows 5 simultaneous connections. You can connect to 180+ servers in 57 countries. you are allowed to P2P/Torrents. Besides, if you want proxy servers, this plan offers proxy servers in all location. There is unlimited bandwidth. high-speed connections make you experience the fast and smooth speed connection. you don’t have to wait for a long time to connect to the location you want. this plan is a great option for people who require strong level of online privacy and security, as it provides such advanced features as Socks5 Proxies, Tor over VPN, double VPN, NAT Firewall and multiple VPN protocols including OpenVPN, L2TP, PPTP, SSTP, SoftEther, IPsec, and Stealth VPN. You also can get browser extension installed in Google Chrome, Firefox, and Opera. You also can get easy-to-use ibVPN apps or software installed in all major platforms including Windows, MacOS, iOS & android. 78% off Holiday Exceptional offer is the best deal right now. You not only can enjoy the biggest savings but also experience all ibVPN’s powerful and remarkable features and technologies. If you have any questions about this ibVPN Holiday Exceptional offer plan, you can get high priority support from ibVPN support center. What Device does ibVPN Support? ibVPN develops compatible apps and software working on computer, Mac, laptop, desktop, smartphone and tablet based on all popular and major systems including Windows (Win 10, Win 8, Win 7, Win Vista, Win XP), Mac OS, Linux, Android and iOS. You can use and install this ibVPN into your iPhone, iPad, Samsung Galaxy, LG, Motorola, Huawei and others. ibVPN setup navigation is easy to understand and follow. Besides, you also can use ibVPN on other platforms as ibVPN also supports other devices like Chromebook, Roku Streaming player, Apple TV, Playstation Consoles, Xbox Console, DD-WRT Routers and Sabai Routers. So, you can use ibVPN on devices you want. ibVPN even offer detailed instructions for setup navigation. ibVPN allows simultaneous connections multiple devices. but different plans and packages have different requirements. Take ultimate plan or holiday exception offer plan, it allows 5 simultaneous connections on multiple devices. that means you can log in one same ibVPN account on 5 devices. this package is especially fit for family usage. 5 family members are allowed to use the same ibVPN account on their devices. However, other plans including Standard, Torrent and ibDNS/SmartDNS just allow 1 connection at the same time. that means you can only use ibVPN account on one device at the same time. ibVPN also provides browser extension working on web browsers like Google Chrome, Firefox and Opera. The ibVPN extension working with web browser makes you experience faster speed when open websites you want. ibVPN provides a medium size network with over 200 servers in over 63 locations from 47 countries: United States, Canada, UK, Germany, Netherlands, France, Switzerland, Sweden, Ireland, Finland, Norway, Romania, Spain, Italy, Czech, Turkey, Poland, Luxembourg, Belgium, Hungary, Austria, Bulgaria, Iceland, Lithuania, Russia, Hong Kong, Panama, Egypt, Singapore, Japan, Australia, New Zealand, Brazil, India, Saudi Arabia, Chile, Argentina, Portugal, Israel, China, Mexico, Korea, South Africa, Ukraine, Vietnam, Slovenia, Denmark. Even though ibVPN does not provides as many servers as other VPN providers, it does offers the servers in popular locations like United States, Canada, United Kingdom, France, Australia, China, Hong Kong and Singapore. So, actually ibVPN has enough servers to help users access any websites from anywhere around the world. ibVPN also provides ibDNS in such locations as United States, Canada, UK, Germany, Netherlands, France, Switzerland, Ireland, Finland, Romania, Spain, Italy, Egypt, Australia, Brazil and India. ibDNS Smart DNS is NOT a VPN solution. ibDNS is actually equipped with sophisticated technologies and scripting, then it can “trick” geo-restricted websites to see you as you were in the appropriate location. After it bypasses the geo-restrictions, this ibDNS service is basically powered by your own internet connection, not by third party server. ibDNS has no ability to hide your real IP address or encrypt your internet traffic. ibVPN provides proxy servers in locations including United States, Canada, UK, Germany, Netherlands, France, Switzerland, Sweden, Ireland, Finland, Norway, Romania, Spain, Italy, Czech, Turkey, Poland, Luxembourg, Belgium, Hungary, Austria, Bulgaria, Iceland, Lithuania, Russia, Hong Kong, Panama, Egypt, Singapore, Japan, Australia, New Zealand, India, Saudi Arabia, Chile, Argentina, Portugal, Israel, Chinam, Mexic, Korea, South Africa, Brazil, Ukraine, Vietnam, Slovenia, Demark. Therefore, if you want to use the proxy server, you can also connect to these locations. ibVPN’s Socks5 servers are in Bulgaria, Netherlands, Ukraine, Luxembourg, Canada, Sweden, Lithuania Russia, and Hong Kong. Sock Secure (SockS) is a protocol used for proxy servers. It works as a bridge connecting your device and the Internet. all your internet traffic won’t be able to associate to your real IP. ibVPN’s Socks5 server can change your real IP but has no ability to encrypt your traffic. ibVPN’s Socks5 server is favorite by users who don’t require a high level of security. 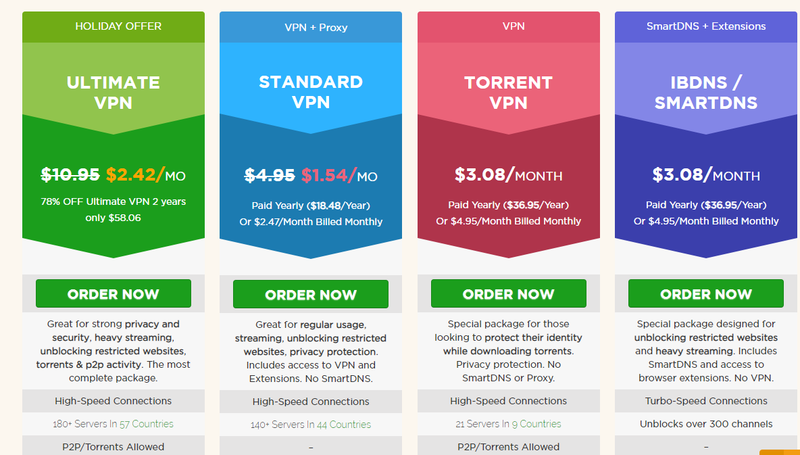 ibVPN offers several Tor over VPN located in Netherlands, Singapore and United States. ibVPN Tor over VPN is best fit for people who require a higher level of online privacy. Tor over VPN allows you to connect to the Tor network via a VPN server. First, your VPN app will connect to the VPN server, then the VPN server will route all internet traffic to a Tor node. And the traffic is encrypted by VPN layer and later sent to the Tor network. ibVPN Double VPN includes Netherlands – United States, Netherlands – Singapore, Singapore – Netherlands, Singapore – United States, United States – Singapore, United States – Netherlands. Double VPN provides a higher level of security for people who want to be anonymous on the internet. this technology allows you to browse anonymously by connecting to a chain of VPN servers like Singapore – Netherlands. In other word, Double VPN is a VPN tunnel inside another VPN tunnel. ibVPN uses the strongest and most advanced encryption algorithms AES-256 bit key to encode your data and all internet traffic before transmitting your data and other information to the internet. aes-256 bit encryption was used by US government and military to encrypt and store top-secret file, documents, data and other information. it is an unbreakable encryption method even though you group up all fast computers all over the world, it can’t be encrypted by fast computers. Therefore, AES-256 encryption method is used in important industry related to data storage to classify and store important data and information. it is usually used by VPN service and VPN tool to protect user’s personal data and information. this encryption prevents all hackers, snoopers and any intruders who want to steal personal information for illegal purpose. ibVPN uses this AES-256key to protect and encrypt user’s sensitive information like contact details, social security number, ID numbers, logins, passwords, PayPal, bank account details, credit card number, business confidential data and more. besides, aes-256 key can protect your internet traffic from ISP. Your ISP will not be able to access your data or spy on your online activities. if you are not using a VPN tool, all your internet traffic will just go through the server of ISP, and ISP can see all your online activities even collect your metadata. But if you use VPN tool with AES-256 encryption, all your internet traffic will be protected and encrypted by this strongest encryption method and you will be shielded against any hackers or prying eyes. VPN can offer 99% uptime, but sometimes, disconnection may happen. Once your VPN disconnect with the server, the internet traffic will just go through your default servers like ISP server back. Once your internet traffic is going through unsecure server, your personal information will be in a risk of being hacked. In other words, in case of VPN disconnection, your internet traffic would be exposed again to default server like your ISP. If the VPN connection fails, your traffic will be redirected through your internet service provider and may be exposed to third parties. Kill Switch feature is specifically designed to solve this problem. when you enable Kill Switch feature on your device, it can protect your data automatically once VPN connection fails. If VPN disconnection happens, this Kill Switch feature will automatically activate and close all applications that are running at the time. but first, you should add the selected apps into Kill Switch app list. Thus, it can quickly protect these important apps and websites in case VPN disconnection happens. Once the VPN connection re-establishes, Kill Switch will soon open the apps again immediately. ibVPN Kill Switch is a useful feature to always keep your data and information secure. Once the VPN disconnection happens, your private information, logins, passwords, bank account number, credit card number, files, documents, business confidential files and more world be leaked out or collected by the ISP or other third parties even prying eyes. It is dangerous. Kill Switch can prevent all these unencrypted data and information from being hacked. Internet censorship is a method used by government to control and supervise their domestic internet and keep internet security. it controls and limits where and what people can browse, view, discuss and publish on the internet. Many countries like China, Russia, UAE, India, Pakistan, Turkey, Iran, Syria etc are implementing internet censorship to protect their domestic internet security. many social media, social networking, messaging, photo sharing, news websites and apps are especially blocked by internet censorship in some countries and regions. Facebook, Twitter, Instagram, Youtube, Snapchat, WhatsApp, Slack, Viber messenger, Line and more are prohibited in some internet–censored countries like China. foreign social media, social networking, messaging, photo sharing websites and apps are always popular and used by thousands of millions of users and sharing almost news and information happening every corner in globe. It will just take several seconds, one new or history will be read and viewed by all users all around the world. These apps and websites can spread news, history and information in a lightning speed. However, these social networking websites and apps can’t be control and supervised the government at all. Terrorists even use these social networking service to contact their partner and propagandize their politic which is usually oppose to government politic. Some unfavorable information even can broadcast through this kind of social networking service websites and apps. However, government can’t control these websites or apps. Therefore, government of some countries and regions have to use internet censorship to block access to these social networking websites and apps to prevent any unfavorable information or news spreading randomly. That’s one of the reason why some countries and regions apply internet censorship and why you can access some popular websites and apps when coming to internet-censored countries. Some countries like China practice strict internet censorship. any disapproved websites will be blocked by censorship immediately. Take China for example, it practices the strictest and most sophisticated internet censorship in the world. besides, the government issues different laws and regulations to prevent unfavorable websites and apps. Any unfavorable information will be detected and blocked by China’s internet censorship. government together with ISP and other organizations uses strong anti-VPN tools to detect and stop VPN usage. So, if you use weak-performance VPN tool in China, your VPN tool will be filtered by these smart anti-VPN tool. How can a VPN survive from internet censorship and access any websites? ibVPN with Stealth VPN feature can successfully bypass the strongest internet censorship and access any websites from anywhere and anytime. Stealth VPN is specifically designed to defeat internet censorship, geo-restrictions and other restrictions you many face while surfing on the internet. actually, Stealth VPN is a protocol which is usually used to circumvent censorship users may face when they go to internet-censored countries like China and websites blocked in their countries. Stealth VPN first makes your internet traffic generated via VPN look like regular HTTPS traffic. Then you can browse the web securely and invisibly. Next, it can remove all information indicating VPN encryption from the header by using Obfuscation technology which usually disguises data into regular HTTPS encrypted internet traffic in two phases. In this way, Stealth VPN can bypass the internet censorship detection and the anti-VPN tool even can’t find out you are using a VPN tool. Stealth VPN not only disguises your internet traffic and hides your VPN usage, but also can guarantees your online freedom and ensure your security by its encryption level like AES-256 bit. ibVPN with Stealth VPN feature is praised by users and the best choice for users living in or just travelling internet-censored countries like China, Russia, UAE, India, Pakistan, Turkey, Iran, Syria etc. ibVPN can help users to access any websites and apps when uses are in these internet-censored countries. you can use this ibVPN to access any internet-censored websites from anywhere all over the globe. A VPN is a must-have for almost internet users. VPN not only can help access internet-censored and geo-blocking websites, but also increase a layer to protect user’s online security and privacy. It prevents hackers from stealing your sensitive information like cloud account, email account passwords, bank account details, credit/debit card number, different logins, pictures and other important information. therefore, you can enjoy complete online freedom and security. ibVPN is a reliable and solid VPN service to help people get more online security as it uses strong and advanced technologies to make people enjoy a higher level of security and privacy online. ibVPN is a trusted VPN as it doesn’t keep logs of users. All your internet traffic is just encrypted via ibVPN connection. 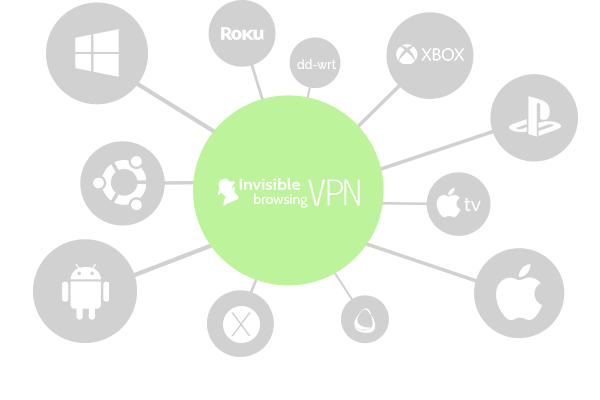 ibVPN is great for strong privacy and security, heavy streaming, unblocking restricted websites, torrents and P2P activity. It offers high-speed connection, then users can fast connect to the server and location within few second. If you prefer torrenting, ibVPN can help you torrent or P2P. torrent VPN is allowed in several countries. 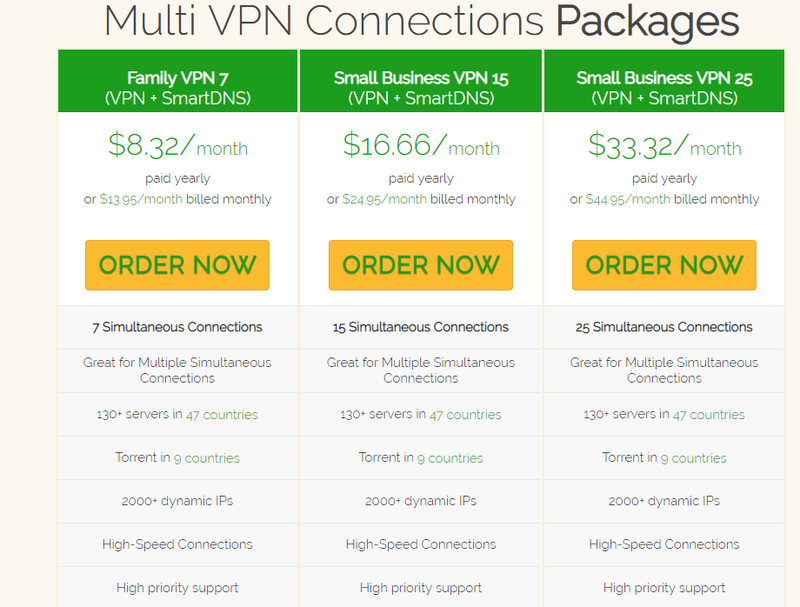 ibVPN provides different plans for various VPN connections packages. It provides 1 simultaneous connection package, 5 simultaneous connections package, and multiple VPN connections packages ranging from 7 to 25 simultaneous connections. Besides, ibVPN provides dynamic IPs for multiple VPN connections packages. Powerful technologies like NAT Firewall, double VPN and Tor over VPN are used in ibVPN tool. All these technologies increase a higher level of security and privacy for internet users.